As voted by the Pacific Coast Bass Anglers, www.bassfishingbc.com, and Bass Anglers of B.C. Facebook page. Andrew G. with a fat Beaver Lake largemouth.Elk/Beaver LakeVictoria, BCAverage Depth: 20 feetMaximum Depth: 60 feetSize: 2 468 000 sq. metresSpecies: Smallmouth and LargemouthNumbers: FairSize: ExcellentOther Species: Rainbow Trout, Pumpkinseed, Yellow Perch, Brown Bullhead.Thanks to www.anglersatlas.com for the info.Elk Lake may be an urban lake, just north of the capital of B.C., but it is also one of the finest bass fisheries in the West. While the numbers of fish might not blow you away, the sheer size of them just might. 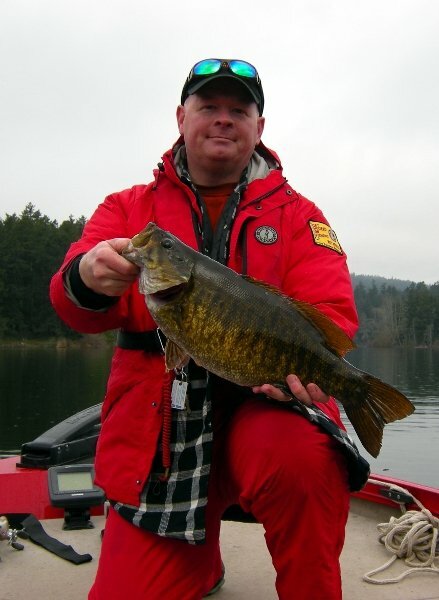 It's one of the best bets in Canada to land a 6+ pound smallmouth or an 8+ largemouth. Elk Lake is connected to a smaller lake, Beaver Lake, by a shallow channel. While Elk Lake holds mostly smallmouth, Beaver is better suited for its wide-mouthed cousins.The largemouth in Elk Lake are a bit of an enigma. Showing up mysteriously in the 1990s (likely via illegal stocking), they took hold of tiny Beaver Lake and quickly began making headlines for their size. The biggest headline of all was made when an 8.7 pound largemouth was brought to the scales by Manitoba native Steve Sasaki at a bass derby in 2005. There have been stories of even bigger bass coming out of Beaver Lakes weedy waters, but none so famous as this one. 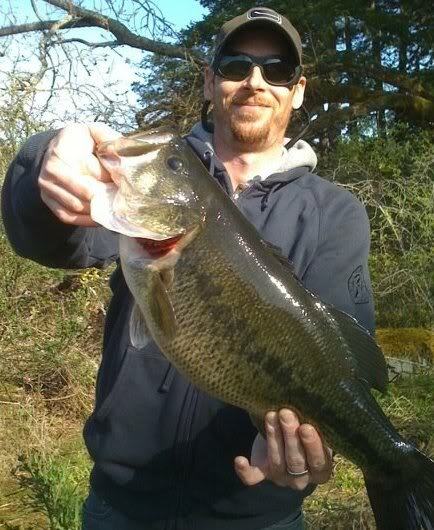 Chad K. with a prize-winning 6 lb. 2 oz. Elk Lake smallie.I've only fished Elk Lake twice, but both times were memorable. The first time was in the afternoon following the 2005 B.C. Open on Shawnigan Lake. We stopped at Elk on our way home and put in our 14 foot aluminum to try for some trophy smallies. While we didn't stay long, we did manage to boat twin 5 pound smallmouth not far from the boat launch, forever putting this lake near the top of by BC trophy bass waters. I can honestly say that as far as average size goes, this lake yields the biggest smallmouth in the province (conservatively, I'd say 4 pounds is average for Elk).Elk Lake does have its problems. It is prone to algae bloom, particularly in the warmer months. This can make fishing a pain as the "snot" sticks to your lure, weights, and line on virtually every cast. While an angler can't always plan around this, make sure to have topwater lures on hand for a reprieve from the algae.An angler fishing Elk Lake for the first time would do well to bring a fishfinder. This will allow you to find humps and drop-offs on the main lake which will hold smallies. Cruise around the lake looking for changes in the topography and start fishing anytime you notice something significant. As far as largemouth goes, Beaver Lake is all you have to know. Once you're in this shallower, weedy area, largemouth won't be far away. The channel between the two lakes also acts as a natural funnel for both species which are attracted to the weedlines located in this area. Jason D. with another fat Beaver Lake largie.Elk/Beaver Lakes are located in the warmest part of the entire country. Southern Vancouver Island has the mildest winters in all of Canada and consequently, the longest growing season. Because of this the fishing starts picking up earlier in the spring than elsewhere, as fish move shallow in preparation for the spawn as early as mid-March. Elk is a year-round fishery as the water temperatures may not even drop below the 40s all winter, keeping the smallmouth bass feeding steadily throughout the cool months.With Victoria close by, there are plenty of accomodations and facilities to be found for the travelling angler. Anglers looking to pick up some gear can find it at one of B.C. 's largest tackle shops, Island Outfitters. Island Outfitters has an outstanding selection of bass tackle and many of the latest hot lures on the market. There isn't a better spot on the island to gear up.Be prepared to fish both shallow and deep at Elk and Beaver Lakes, and with both baitcasting and spinning outfits. Here's a little advice on what gear to bring:6'6" Medium-action Spinning Combo (I like the Abu Verdict rod) spooled with 6-10 pound Berkley Vanish Transition FluorocarbonOn your spinning rod try:-A variety of dark-coloured tubes-Stickbaits (such as the Berkley Sinking Minnow)-Poppers-Twin-tail grubs (such as the Berkley Havoc Deuce)7' Medium-Heavy Baitcasting Combo with 50 lb braid (Spiderwire Camo works well) or 20 lb monoOn this combo try:-Spinnerbaits in light and dark colours-Deep and shallow-diving crankbaits-Jerkbaits (especially in the early spring)-Carolina-rigged plastics7' 6" Heavy Flippin' Stick with 50-65 lb braidOn this combo try:-A variety of 3/8 to 3/4 oz. brush jigs-Floating frogs-Swimbaits (the Berkley Hollow Belly series is a good option)-Berkley Chigger Craws Texas-rigged on a 4/0 hook with a 1/2 oz weightThanks to members of the Bass Anglers of B.C. Facebook page for the photos. 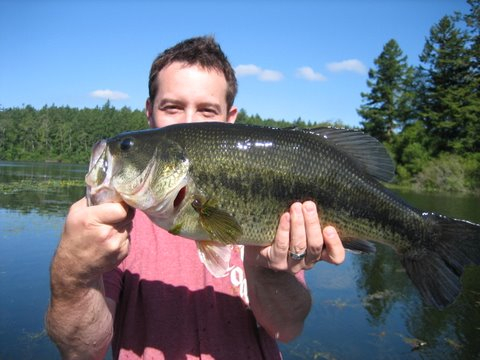 Check them out at:Bass Anglers of BCStay tuned for #4!